1. That huge FullView Display – The 5.99-inch HD display greeting you up front is hard to miss. Shaved of excess bezels all around, the Huawei Nova 2 lite’s FullView panel helps you get lost in whatever content you fancy – movies, pictures, and games all look amazing with a display this big. 2. Selfie Toning Flash for maximum selfie clarity – Say goodbye to dark and blurry selfies! The Nova 2 lite is equipped with a dedicated flash on its 8MP selfie cam so you can take sweet self-portraits no matter the lighting condition. 3. Bokeh perfection with Dual Rear Cameras – Swiping from the cutting-edge lens of its flagship siblings, the Nova 2 lite’s Dual Camera systems mimic bokeh-rich, pro-level snapshots. With a wide aperture and PDAF built in, you won’t miss any exciting moments with these cameras at your disposal. 4. Colors to fit your style – Available in sleek Black and Blue color variants, the Nova 2 lite is sure to complement your personal style. Whether you prefer a stealthy, professional look with Black or a more fun and eye-catching presence with Blue, you’ll never go wrong with Huawei’s trademark craftsmanship. 5. It’s under Php10,000 – At Php9,990, the Nova 2 lite is an absolute steal especially given all the additional features it has: 3GB of RAM, a 3,000mAh battery, triple-card slot, Face Unlock and so much more. All that style and substance at an incredibly affordable price point. 6. 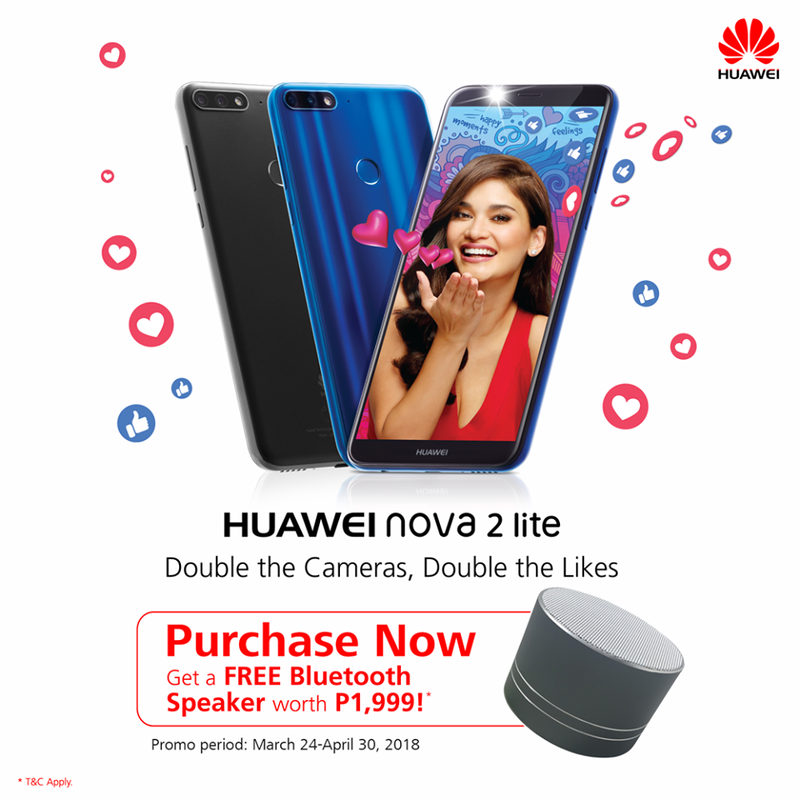 Party on with a free Bluetooth speaker – If you like pumping out your dope playlists with your friends, the free Bluetooth speaker that comes with buying a Huawei Nova 2 lite should be your jam. This deal only lasts until April 30 so better hurry!